In the 1950s, conferences were essential in creating notions of solidarity and collective purpose among Asians and Africans. In our own Afro-Asian Networks conference last week, we traced the great arc of conferences that characterised the Bandung era. Many of the participants at the 1955 Afro-Asian Conference in Bandung first met in the 1947 Asian Relations Conference in Delhi. The Afro-Asian People’s Conference followed in Cairo in 1958, along with the All-African People’s Conference held later that year in Accra. The speed and intensity of these gatherings was facilitated by air travel. In the wake of the Second World War, air travel was increasingly accessible to new Asian and African leaders, as well as civilians. How did this new mode of travel shape the nature of these conferences? The short hops of air travel in the 1950s allowed participants to work their way to a conference through multiple pit stops, getting to know the territory in between and building personal relationships. In her paper on the Delhi People’s Conference, Carolien Stolte noted that a number of delegates on their way to Bandung stopped in Delhi to attend the Delhi People’s Conference, a grassroots, ‘rival’ conference to the highly orchestrated affair at Bandung. Her last post from this blog features a photo of Nehru and Nasser at the Delhi People’s conference. After Delhi, both Nehru and Nasser then traveled to Rangoon en route to Bandung, where they met U Nu to participate in Burma’s New Year Water Festival (Thingyan) celebrations, donning traditional Burmese longyi and gaung baung. Informal conversations between Nehru, Nasser, and U Nu — as well as other officials and delegates in their entourage — must have sparked conversations about shared visions for the Afro-Asian world days before Sukarno welcomed them in Indonesia. With Sukarno, these leaders were those most committed to the idea of Non-Alignment at Bandung. 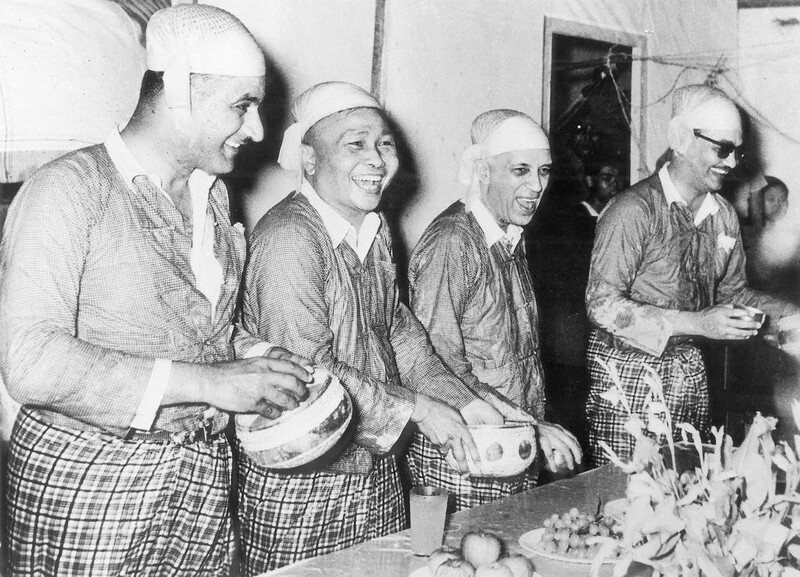 Nasser, U Nu, Nehru, and Egyptian Minister Salah Salem celebrating the Burmese New Year Water Festival in Rangoon en route to the 1955 Bandung conference. The 1947 Asian Relations Conference was the starting point for another set of relations between Asians and Africans. At Delhi in 1947, socialist leaders from India, Burma, and Indonesia first mooted the idea of an Asian Socialist Conference. Sutan Sjahrir, one of the leaders of the Indonesian Socialist Party, was involved in these discussions. Sjahrir had studied in the Netherlands and returned to lead the Indonesian Revolution. By 1947, he was involved in formal independence negotiations with the Dutch. As Rudolf Mrazek notes in his excellent biography of Sjahrir, the Dutch government tried to prevent the spectacle of Sjahrir ‘breaking out of their embrace’ by offering a special KLM plane amidst rumours that Sjahrir might travel to Delhi on a British plane. In a declaration of aeronautic non-alignment, Sjahrir traveled to Delhi on the private plane of a Bengali businessman and friend of Nehru. On his return, he stopped in Rangoon, meeting with U Nu and other socialist leaders, as well as Singapore, meeting with the United Malay National Organisation. These meetings with Asian leaders, fostered by the short-haul flight, helped prepare the groundwork for the Asian Socialist Conference, held in Rangoon in 1953. A Burmese scholar, Kyaw Zaw Win, sees the Asian Socialist Conference as a ‘precursor’ to Bandung: Africans were invited as observers, and delegates advocated that both Asians and Africans act together at the United Nations. 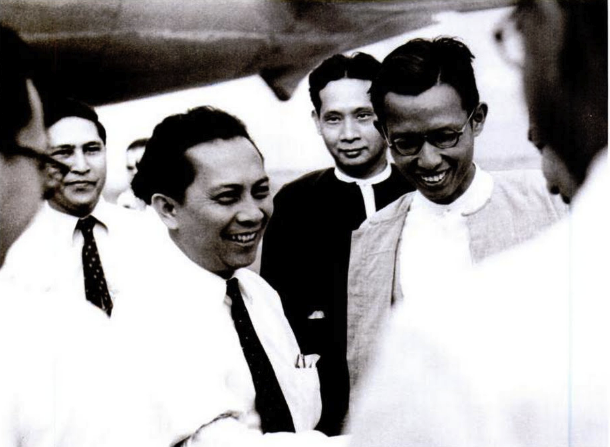 Sjahrir, U Ba Swe, and U Kyaw Nein meeting on the tarmac in Rangoon before the 1953 Asian Socialist Conference. This photos and others of Sjahrir’s life and journeys are found in Rosihan Anwar’s biography, republished by Brill in 2011. Socialist solidarity among Asians and Africans was also hampered by the hardening of national borders. Later bureau meetings of the Asian Socialist Conference (ASC) took place in Hyderabad and Tokyo to discuss ideas of economic cooperation and create further links with Africa. Indonesian socialists had hoped to host the ASC’s third meeting in 1954 in Bandung, but due to the Indonesian government’s refusal to allow entry to socialist leaders from Israel, the meeting was moved to Kalaw, Burma. Pakistan’s government refused visas to members of India’s Praja Socialist Party for the meeting of the Pakistan Socialist Party’s National Conference in 1954. Efforts to cooperate internationally were undermined by barriers created by new national governments. Globe-trotting politicians had their tickets paid for by national governments and political parties. Asian and African activists, artists and intellectuals also benefited from the Cold War competition for hearts and minds. The archives are full of negotiations over the price of air tickets between national governments, and between local and international organisations. Cultural delegations to and from China, the Soviet Union, and Yugoslavia crisscrossed the Afro-Asian world. The US State Department subsidised a number of African-American jazz musicians, athletes, and labour leaders to fly to Asia and Africa. These were, of course, a select few: one of the world’s most famous African-American cultural icons, Paul Robeson, a member of the Communist Party, had his passport revoked, preventing his participation at the Bandung conference in 1955. In the 1950s, the layover meeting and the tarmac greeting heralded a new age of Afro-Asian diplomacy. With the high cost of air travel, powerful patronage networks served as gatekeepers for who could travel and interact. We should see the Bandung era as a series of meetings and conferences, rather than one major diplomatic event, in which ideas of solidarity were both propped up and undermined by national interests. Air travel knitted the world together, but also introduced a new kind of post-colonial politics: with the advent of mass aviation, it was borders, visas, and passports - the hallmarks of national identity- that were becoming more important than ever. *note: if you have a story about travel in this era, please consider submitting it to our blog, Afro-Asian Visions on Medium. Historian of cities, decolonisation, and modern girls in Southeast Asia and beyond at the University of Bristol.